this week we have a lovely new up and coming shop: pretty swell. 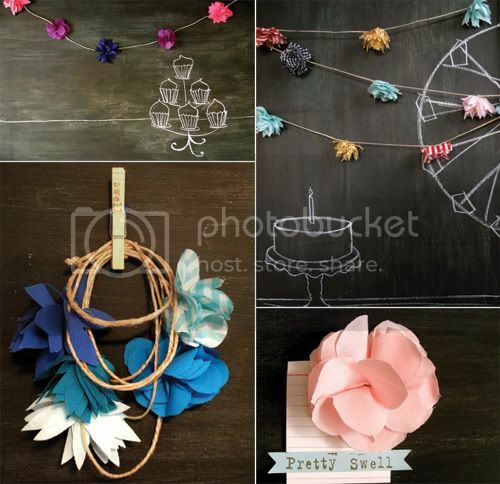 katie makes the most fabulous flower garlands, perfect for a party, wedding, or just to hang as decor. i really love her use of colors and styling in her photos. 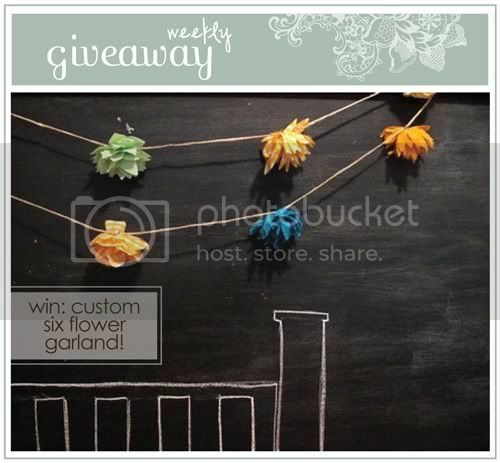 one lucky winner will win a 6 flower custom garland and Custom Fabric Flower Hair Pin! Hello! Please tell us a little about yourself! I was born and raised in Las Vegas and I now live in Hawaii on the island of Oahu. I am a wife and a mom. I went to school at BYU and received a BFA in Studio Art. I love many things…. some of them are the ocean, surfing, painting, crafting, baking, riding bikes and being happy! What inspires you from day to day? Lots of things inspire me… My best ideas come when I get out into the world. Being outdoors and looking at the details of the beautiful world we live in. I also find inspiration in traveling and seeing the people of the world. People who don’t just talk about the things the want to do…. they actually DO them. Those people really inspire me. I also get ideas and inspiration from other people through pictures, magazines and lovely blogs of course! How did you get started making your beautiful items? I created them for a friends birthday party. I ended up combining two item trends (garlands and handmade flowers) to create my own item..... Fabric Flower Garlands! At the party people seemed to like them and I loved how whimsical they were. As an added bonus, I enjoyed making them. So I decided to make an Etsy shop! with your favorite item from katie's shop . you are the lucky winner! 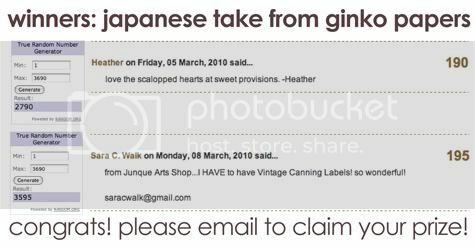 won the 3 japanese tape-pack from the lovely ginko papers! + dear beatrice: congrats to melissa, #235! winners: please email me to claim your prize! <3hearts- oh, hello friend ! oh, and i love the minty fresh 10 flower garland. the colors are nice together. I love the Minty Fresh 10 Flower Garland, too! Everything in the shop is adorable, though! i am so obsessed with garland!! these are too cute! my favorite is fabric flower party set!! adorable! Ooo i just love Moody Blues 10 Flower Garland. so pretty! I love the woodland 6 flower garland! The colors are perfect! ooooh i just garlands! These are so pretty! I *heart* the Daffodil flower garland - perfect for Spring! mmmmmm. such a beautiful shop! my fave is the Vintage Carnival 6 Flower Garland! Oh My!! I won!!! It's incredible!! Also this giveaway is amazing! I adore the Moody Blues flower garland! I love the Woodland garland. Thank you so much this is such a blessing, I`m just opening an Etsy store! The Grannybirds Daffodil Garland is gorgeous! So pretty and colourful. Simply I just love the Vintage Carnival 6 Flower Garland. I love the "Juicy 6 Flower Garland"...very beautiful colors! i love her blue moon garland. beautiful colors! LOVE the "Minty Fresh 10 Flower Garland"! So perfect for spring! Beautiful creations! I LOVE Moody Blues 10 Flower Garland, CUTE shop! OH! how wonderful! 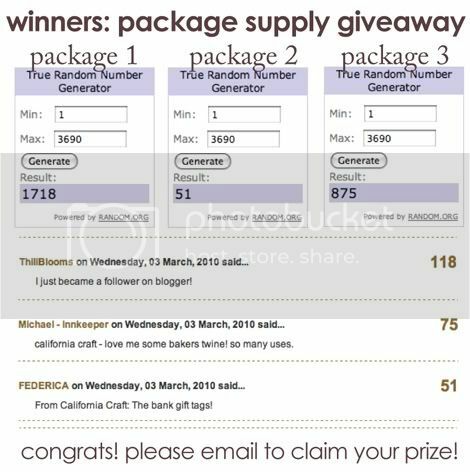 this is my first time ever winning a blog giveaway. and what a great prize! thank you, thank you, thank you!! and I do so love to tweet! I love the vintage carnival garland! so pretty! her garlands are so cute, I would be so happy if I won this one!! Thanks! I've been wanting to order from Pretty Swell for SO long! I absolutely LOVE their garlands! I think my favorite is the Minty Fresh 10 Flower garland. The Vintage Carnival garland is just too cute!! What a fun idea! Ooh, the moody blues ten flower garland is just what i'm looking for to string in the trees for my sister's wedding. I just adore the grannybird daffodil garland...adorable! The "Fabric Flower Party Pack" in bright pink, dark purple, orchid, is not only brilliant but GORGEOUS!! I love the Fabric Flower Party Pack! Her work is so sweet! I tweeted about this lovely giveaway, http://twitter.com/Shes_Wanderin/statuses/10222128651. this would be so cute for an outdoor party on the patio! I would love to win any of these amazing garlands - either really bright colors for our picnic or purple tones for the wedding! Love Elza's Party 6 Flower Garland! Love love love the minty fresh 10 flower garland. Well actually all of them. But the minty fresh is my favorite. Love the garlands... so perfect for spring! What pretty items! I love the Woodland 6 Flower Garland. The yellow checkered flowers are simply adorable!! oh my goodness - those flower garlands are awesome! I especially love the purple and blue ones which would match my upcoming wedding decor!! I just adore the Minty Fresh garland!!!! The colors are soo adorable! It has to be the custom flower garlands, not only are they beautiful but the display is so lovely, I love the colours and the font is delicious. I like the fabric flower party pack! Wow I've never seen a garland like this, very pretty. I like the Juicy 6 flower one. near impossible to choose, but i think my favorite is the vintage carnival garland. dreamy. I love the minty fresh garland. I'm getting married in August and our colors are sunflower yellow and baby blue. Our reception is going to be in an old machine shed and that garland would go perfect with our decorations. LOVE the Vintage Carnival 6 Flower Garland! Thank you! hey I am at BYU, too! so cool! i love the flower garlands... but my favorite is the fabric flower hair pin, so i can always show it off! i seriously will have to buy one if i don't win! This would add a touch of spring to my house - much needed! Love the Juicy 6 garland. I would want to make a custom garland with the colors minty and pale yellow! Lovely spring decor! the vintage garland makes my heart super happy :) she's been on my favorites list for quite some time. i just need the perfect party now! xo. The Fabric Flower Party Pack is such a great ideat!!! Love it! I love vintage carnival. So festive and fun! oh my goodness... i love ALL her custom flowers. i can't choose! The Blue Moon 6 Flower Garland is really cute, especially the flowers made of gingham fabric! Love all the garland! I did a post on Swell not too long ago! The Woodland 6 Flower Garland is adorable. All of the flower garlands are so bright and cheery...well done! I love the fabric flower party pack. I love the Grannybird Daffodils. I also love how she uses the chalkboards for her work. So nice, such cute presentation. the juicy 6 is great! my favorite are the woodland garlands! :D. and i love the chalkboard drawings! Love the Vintage Carnival 6 Flower Garland. So cute! I love the Blue Moon 6 flower garland! I love the Teardrop Flower Hair Pin! Her name is Katie! :D My favorite is the Minty Fresh 10 Flower Garland! I love the party flowers! My favorite is the Minty Fresh 10 flower Garland! So pretty! i love the teardrop flower hairpin in lilac! Such a wonderful shop! I am definitely all about the flower garlands -- Vintage Carnival is my favorite. Hooray! Ooh, the moody blues garland is GORGEOUS. wow i love the garlands!!! my heart is a flutter over her shop!! i adore every item, but since i have to choose just one, i'll go with Woodland 6 Flower garland. thanks! The vintage carnival garland is super cute! I love the Fabric Flower Party Pack. The pink and purple colors are so pretty! Im loving the Blue moon garland! such gorgeous colours together! I'm loving the hair clip set! I love, love, love the Blue Moon 6 Flower Garland. Blue is my favorite color! LOVE the Woodland Garland and the hairpins. I love the woodland garland! Ooh! My favorite would definitely have to be the Custom 10 flower garland--I absolutely adore color (I have a multicolored pennant banner hanging in one room of my apartment), and this lets you pick tons of different colors! How beautiful! I love the minty fresh flower garland! Oh goodness I love the Juicy 6! What lovely garlands. My fave is the vintage carnival 6 flower garland. Grannybirds Daffodil Garland. Perfect timing to match the live garalnds on my dining table and to last well after those have faded. the custom 10 flower garland is beautiful! I love the Woodland 6 Flower garland, it's beautiful! Oh my gosh I am SO excited to find out about this shop! I have been searching for a beautiful flower garland. I wish I had the patience to make my own...but it would be even better to have one from Pretty Swell! :) My favourite is the Woodland 6 flower garland- but it is so hard to decide! The blue moon flower garland is so lovely! I seriously love those! My favorite is the grannybirds daffodil garland. I love the Fabric Flower Party Pack in all of the pretty purples. woodland 6 flower garland is adorable. i absolutely love all of the garlands!! love the fabric flower party pack--great color combinations. I'm trying to enter all your giveaways! you have always such beautiful gift! I love Elza's Party 6 Flower Garland...it would be perfetc in my house! oooh I love the teardrop flower hairpins! The garlands are adorable too, but I could get so much use out of the hairpins! I love the gingham flower hairpin! I love the adorable hair pins! I love the colors in the juicy garland! The Elza Party 6 garland. All of them look so lovely! I just love this beautiful Elza's Party 6 Flower Garland- would be so nice to have it in our new flat for the house warming in may...! Love the shop! My fave is the vintage carnival flower garland. thanks! I have just the right spot for some decorative love like Katie's Woodland 6 Flower garland! My fingers are crossed! wow, I've seen these on etsy, they're in my favourites! my favourite is definately the custom flower garland, I know that sounds predictable but I love that it can me made to suit a space perfectly. my favourite colour is minty - but in reality they're all pretty great!